I wrote about tablets as eventual replacement for heavy text books quite some time ago. While the idea seems far-fetched and may not be favoured by many parents, a government-aided school in Kuala Lumpur has recently taken the first step towards testing social media as teaching platform. The tool they use is none other than tablet computer, or simply known as tablet. What this means is that, there will be more and more tablets in schools and people will start coming up with innovative ways to maximise the usage of this popular gadget. St. Mary's started with social media, but with time, ideas will be pouring in, including replacing heavy text books with tablets. Malaysian secondary school St Mary's KL will pilot Malaysia's first social media platform, which is dedicated to education, according to EduNation Programme founder. "Technology advancement moves at a rapid pace. Students' exposure and hands-on knowledge about the world of Internet and digital media, is critical. In today's new work environment, high IT knowledge and the know-how of using digital media should not be limited only for those studying IT as a career option. All of our children need strong skills in IT. From doctors to engineers, lawyers and teachers; we all need these skills. Our children, who in the future will look for employment, will need to, for example, apply for jobs online." - Goh Hai Bee, St. Mary's school principal. The school Alumni Club's initiative to bring EduNation and Ninetology to the school has made the EduNation Programme a reality. The programme is expected to expose students to a new pedagogical approach using technology for teaching and learning. Teaching videos for Mathematics, Science, Economics, Accounting and languages such as English and Bahasa Malaysia as well as an online exercise and test paper can now be conducted on a social media platform so that participating students will be able to practise their comprehension on subjects and concepts. The idea behind the EduNation Programme is to enable any student in need of academic assistance to be connected to parents, teachers, volunteers and fellow students to receive free real time tuition powered by the Malaysian Community. EduNation Programme aims to complement the Malaysian Education system. By putting the entire Malaysian school syllabus online, free for all, we will empower every Malaysian regardless of their economic status to excel in school. 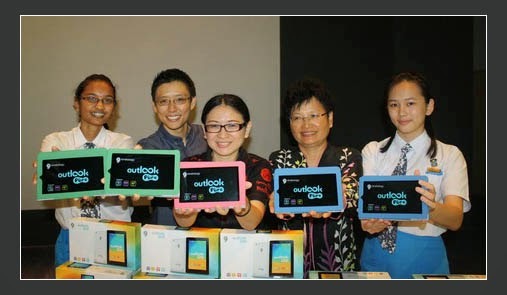 TheGreenMechanics: Tablets and other mobile devices, and technology related to such invention are not going to fade away, so we may as well put them to good use in the education industry, such as the EduNation Programme. Bila sudah mula disediakan di sekolah nanti, pasti ada yg cuba menyalahgunakan. Technology has both pro/con in the same coin.